Sometimes I'm amazed at just how much comfort one simple dish can bring to me. Tonight's dinner, Sukiyaki, did just that. To say that I've been stressed out lately is abit of an understatement at the moment. I've actually had a pretty rough week, which all began on Thursday with the arrival of unusually wild Santa Ana wind conditions. We endured a rather terrifying night as strong gusts of wind, some hurricane force, wreaked major havoc in the Los Angeles area, particularly in the San Gabriel Valley where I live. Huge trees were uprooted all over, power was lost in many areas, property damage was widespread and schools were closed for a couple of days. My home, being older, sustained quite a bit of roof damage and this whole bout of bad luck just couldn't have come at a worst time, especially with Christmas right around the corner. Huge trees toppled and uprooted by the Nov. 30 windstorm. Needless to say, I've got alot going on in my head at the moment as I try to sort out the financial burden of this situation in addition to dealing with work, my homeowners insurance, repairs, clean up (yes, still picking up bits of debris) and setting up my Christmas to-do list. Do you ever feel like you have so much to do and don't know where to start? That's me at the moment. In times like these, the simplest things in life bring me such great comfort. Having a laugh with the kids over something silly. Rubbing my dog's belly while her little left leg starts the thumping motion. A Harry Potter movie marathon on Starz. Having a piece of outrageously good dark chocolate. 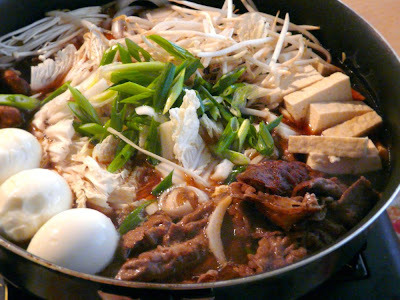 And settling down to dinner with Sukiyaki on the table. All of a sudden, things seem much better. 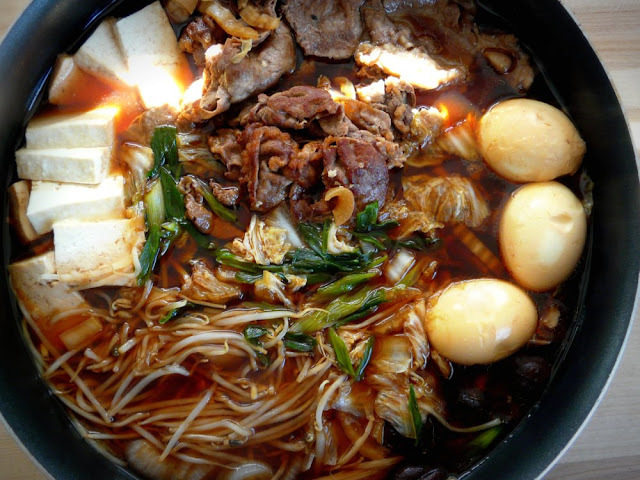 Sukiyaki is a Japanese soup/stew dish that is typically cooked at the dinner table. It is similar to shabu shabu but uses a broth that is a little sweeter. 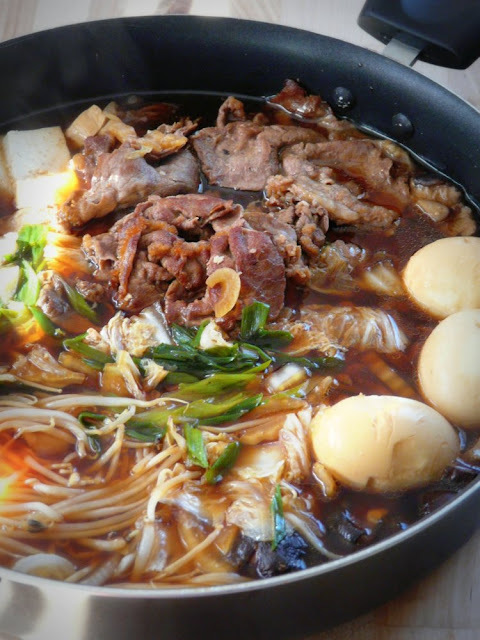 It consists of thinly sliced beef (or sometimes pork) accompanied by vegetables and mushrooms that are simmered in a sweet and savory broth. 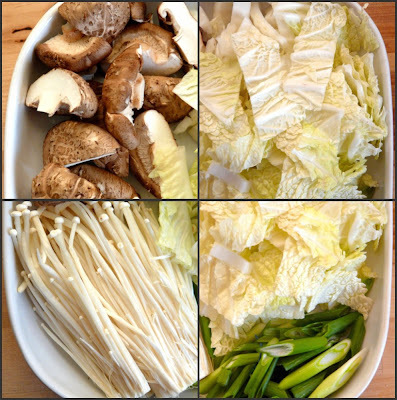 Although it is traditionally cooked in a sukiyaki pot, you can also use a large, deep skillet or pan. It is a quick and easy dish to put together on weeknights and cooks up in just minutes. You can purchase pre-sliced beef at most Asian grocery stores. They are usually labeled "shabu shabu beef". You could also prepare the meat on your own by partially freezing well marbled steak (such as rib eye) prior to cutting with a very sharp knife. The slices should be as close to paper thin as possible. 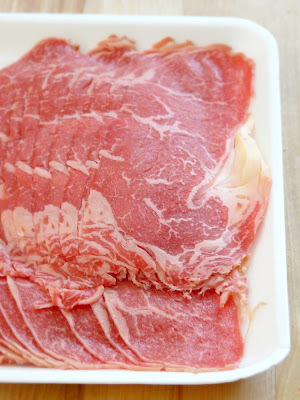 Pre-sliced beef for sukiyaki or shabu shabu. 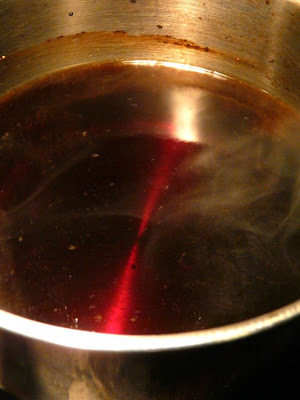 bring to a boil for about 2 to 3 minutes. Heat the skillet over high heat. Lay the beef slices down in a single layer and brown one side, then the other. When they're done, push the cooked beef to one side then lay more slices down. 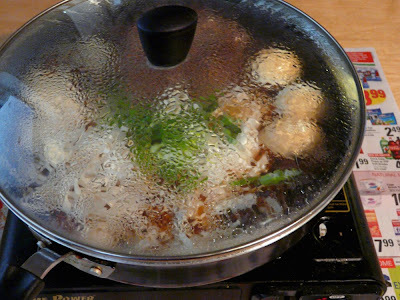 Once all the beef has been browned, add the broth to the pan and bring to simmer. Add the remaining ingredients by grouping them into neat sections. I had some leftover (albeit dinged) hard boiled eggs so they went in as well. Top with the sliced green onions. or until all the vegetables are tender. Serve with rice or more noodles. This was one of the easiest recipes I've ever tried out and now it's turned out to be one of my favorites. I did make a couple of tweaks though. I didn't have hard boiled eggs but I added slices of fish cake. I also only used an eighth cup of sugar since I've been extra sensitive to sweet foods lately. The broth still turned out sweet and savory. Finally, I soaked the udon noodles in hot water for a few minutes to make sure they were soft enough for my preschooler after it got cooked. All in all, it turned out great. My family enjoyed it. This has definitely made it into my top ten things to make for dinner. Thanks for sharing this recipe! La Fuji Mama — Bringing world flavors to the family dinner table. This is my story and I'm sticking to it! © 2011 The Red Gingham. Simple theme. Powered by Blogger.